Summary: Olivia and Kat are twin sisters dealing with their mother's abandonment in two very different ways - Olivia, through emotionless hookups, and Kat, through computer games and yelling at the cast of the play she's in. Juniper is one of Olivia's best friends, her perfect exterior hiding a secret that is far less perfect. Claire is their other best friend, doomed always to be lesser than her more popular, more beautiful friends. Lucas is Claire's ex, and hides more than just the fact that he deals alcohol and weed. Matt, one of Lucas' "clients," harbors a heart of gold and a massive crush on Olivia. And Valentine, the neurotic outsider who becomes an object of interest to Lucas, is the one who initially leaves the anonymous tip about one of their teachers having an affair with one of their students. 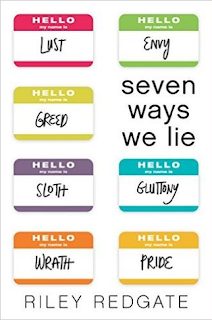 Seven students, through their own personal sins, become connected as scandal sweeps the school and each one realizes that they have their own personal demons to face. That said, this book isn't so much about the affair. It's the catalyzing event, but the affair itself wasn't the most important part, if that makes any sense - the main characters themselves don't find out the real truth until halfway through the book, and while it affects them, it isn't necessarily their most pressing concern. If you like stories that are more about individual character arcs rather than plot twists and turns (which I do), then you'll like this one. I found each character to be compelling in their own way, even when they weren't necessarily being likeable. Each character is supposed to "represent" a different deadly sin, but that wasn't always apparent. 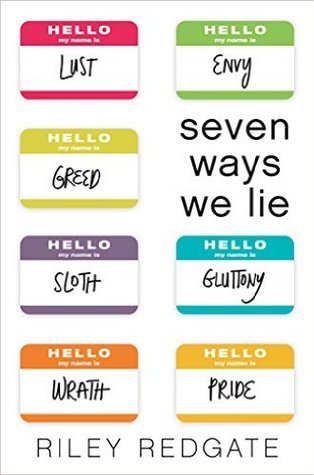 And maybe the point isn't to be able to match them up perfectly at all, because as it turns out, no one only has one sin anyway, in this book or in real life. It can be easy, through all the shifting points of view, to lose track of who's narrating, but I felt like for the most part, the voices were pretty distinct. It's an interesting, varied, complex cast of characters, and even the affair itself isn't as cliched as you might expect. This was a well-written, thought-provoking book, and I can't wait to read more from this author in the future.